Enterprise Mobility Suite: Steps to get to Azure AD Premium when already using your hybrid Configmgr 2012 R2 and Windows Intune infrastructure. Enterprise Mobility Suite (EMS) is Microsoft’s new bundle that includes Azure Active Directory Premium, Windows Intune and Azure Rights Management.The Enterprise Mobility Suite is Microsoft’s answer for Mobile Device Management requirements. For people that have already Configuration Manager 2012 R2 , you can connect your Windows Intune subscription to get a single pane of glass for management. In the so called hybrid mode you can manage all your assets, from one single console. While you can create a new WAAD (Windows Azure Active Directory) account directly from the Windows Azure Management Portal, but the most common way that WAAD directories where created before EMS existed was through the Windows Intune Sign Up process. When setting up an Windows Intune subscription for the first time, you have to pick a tenant name (In our case demolabsbe.onmicrosoft.com). When you create the tenant name, a Windows Azure Active Directory (WAAD) account is created behind-the-scenes to store your users and groups, using the domain “demolabsbe.onmicrosoft.com” (you can add your domain names to this WAAD account later, but you will always have the original .onmicrosoft.com domain associated with it). Windows Intune creates the WAAD accounts, but doesn’t let you manage it out of the box . You only can attach custom domains, configure users, groups & global administrators from the Windows Intune account management portal. Attention: The WAAD account is not the same as a Windows Azure Subscription. A Windows Azure Subscription does not get automatically created or associated to your Windows Intune or Office 365 subscription or visa versa ! When you log in with your Windows Intune tenant account into the Windows Azure Management Portal (https://manage.windowsazure.com) you will see a message that there are no associated Azure Subscriptions. Windows Azure however lets you manage all the advanced settings of WAAD accounts, including names, premium features, Apps, SSO access, multi-factor authentication, etc. The Enterprise Mobility Suite (EMS) feature , Windows Azure AD Premium can only be managed properly when you link your Windows Intune WAAD to your organizational Windows Azure Subscription. 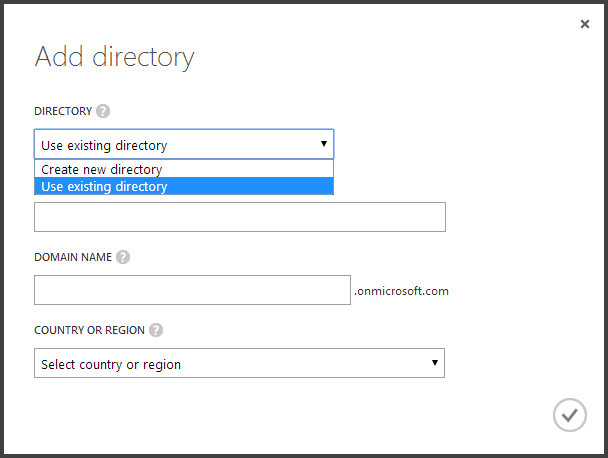 Step 1: How to add your Existing Windows Azure Active Directories to your Windows Azure Subscription ? 1. Login to Windows Azure Management Portal with your Microsoft Account. 2. 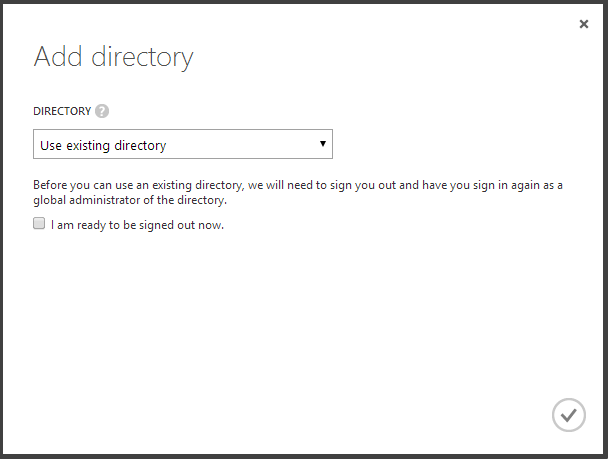 Click on the Active Directory category on the left, and then click the New button. 3. Choose New > App Services > Active Directory > Directory > Custom Create. 4. On the Add Directory dialog, click the Directory dropdown, and choose Use Existing Directory. 5. The dialog will switch, and inform you that you will be signed out, and need to sign in with a Global Administrator for the existing WAAD account. Check the box and click Sign Out. 6. Login with a Global Administrator for the WAAD account. 7. Once you login, you’ll be asked to confirm the link. Linking will make the Microsoft Account a Global Administrator in the WAAD account. Proceed through this, and you will be asked to Sign Out. 8. After Signing Out, and signing back in with your Microsoft Account, you’ll now see the WAAD account in the list of Active Directory accounts in the Windows Azure Management Portal! Now that your previous created Windows Azure Active Directories from Windows Intune are visible within our Azure subscription , we can add the Azure AD Premium features to it . In the picture below , you will see a newly created WAAD called EMSExperts from the Azure portal . By default the Azure AD Premium can be found under the licenses tab. Now you can assign licenses to users. In the other picture below , you will see the previously created WAAD from Windows intune ( added to the azure subscription later ) called MSCloudExperts. By default only the Windows Intune licenses can be found but the Azure AD Premium cannot be found under the licenses tab. To add the “Azure AD Premium” licenses , you must go to the bottom of the page and hit the “Activate Trial” or “Purchase” .